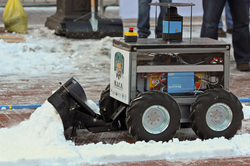 We produce,invest,distribute and sell the best in robotic snow removal units. Our goal is to help promote the robotics industry. This is not only a business but a non-profit initiative as well. With this website we help donate a portion of our profits to different charities and buy jackets for the homeless. We hope to help the world and make some money along the way.Follow us into a cool future of robotics. QR Code for our mobile phone app below scan to be taken to mobile website!